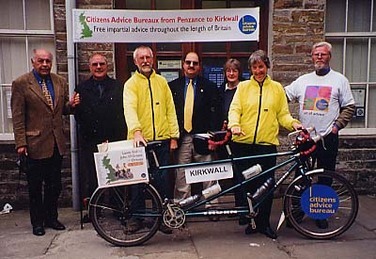 After we have enjoyed a leisurely breakfast wearing proper clothes instead of cycling kit for a change, we retrieve the tandem and walk into town with it for our official arrival at Kirkwall CAB. We are met by the manager, Angus, his chairman and two advisors, Sylvia and Mark. We take lots of photos of the tandem + banner and publicity material with various combinations of people and we all pose together and smile for the press photographer from the Orcadian. Sheila has her last tour of a CAB office and discussion about the business of giving advice. I chat to Mark who is a cyclist as well as being a CAB volunteer. He admires the tandem and we talk about spd pedals that he has not tried on his Raleigh Randonneur, which is the bike he uses for his tours. With plenty of time since retirement and a tolerant wife he has had some long spells away from home with the bike. Mark does not look the 68 years of age that he claims to be and is obviously a free spirit who does not believe in planning too closely where a journey might take him. He has cycled the End to End in both directions. He also tells me about a recent trip to Scandinavia that ended up in Germany returning to England via Harwich, from where he was summoned by his wife to return by train so as to be back in time for a family wedding. We chat on about some of his other trips by bike to Spain and across America and Mark casually mentions another earlier tour, “when I cycled around the world”.